A growth boundary is a land use tool used to direct development to the most appropriate areas and limit development beyond those areas. The boundary is a geographic delineation which marks the separation of an area where more intense development is appropriate from an area where development should be minimized. Growth boundaries are not intended to stop growth, but to direct it to the locations where growth is desired and will be supported by necessary infrastructure, facilities and services. These include public water, public sewer, and public transit. Municipalities would limit the extension of utilities and infrastructure outside the boundary in order to encourage growth within the boundary. Regional planning and coordination could enable this tool to be used across a multi-municipal region. Indicates to property owners, developers and the public which land is most appropriate for development. Requires addressing misconceptions regarding the level of growth permitted outside the boundary. The area and dimensions of a growth area should be based on an objective understanding of a municipality's anticipated population growth and development rates for the coming years, based on historic growth patterns, average household size, desired densities, and other criteria. Implementation should take place through a comprehensive planning process and the resultant revisions to land use ordinances, specifically the zoning map and ordinance. Regulatory changes and incentives (such as higher densities) should be used to encourage and accommodate growth within the boundary area. Increased protections for rural, agricultural, and environmentally-sensitive lands outside the growth area should also be enacted, such as limiting density and uses and adding natural resource protection standards within the zoning ordinance, or implementing a Transfer of Development Rights (TDR) program. Growth boundaries should be re-examined periodically to ensure that they provide adequate size and flexibility for growth. The staff of the Chester County Planning Commission is available to assist municipalities in creating and adjusting growth boundaries. The Lancaster County Planning Commission promoted the use of growth boundaries in the 1990s, and created a county-wide map that recommended potential growth boundaries on a lot-by-lot basis. Local municipalities then chose to modify and implement the boundaries. Pequea Township was the first municipality to implement urban growth boundaries in Lancaster County, and has retained the boundaries with modifications to reflect anticipated growth. 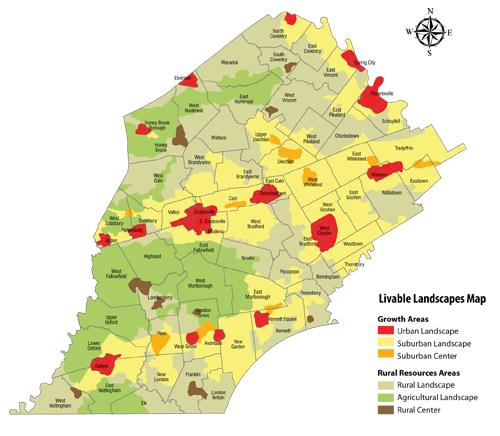 The 1996 Chester County Comprehensive Plan, Landscapes created the Livable Landscapes Map, and with its update in Landscapes2, it identifies the general locations of growth boundaries. The Urban, Suburban and Suburban Center "Livable Landscapes" represent growth areas, while the Agricultural, Rural and Rural Center "Livable Landscapes" represent areas where less growth should occur. The Natural Landscape is an overlay area where sensitive natural areas are to be preserved. In Chester County, West Fallowfield Township has identified areas where growth should occur and where its agricultural areas should be protected from development. Section 301 of the Pennsylvania Municipalities Planning Code requires comprehensive plans to contain a statement of objectives concerning the location, character, and timing of future development. The comprehensive plan must also contain a plan for land use including provisions for the amount, intensity, character, and timing of land uses. Growth boundaries are a tool which can help to meet these requirements.